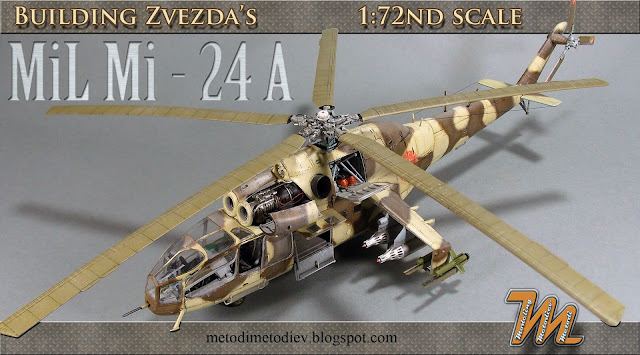 Zvezda's line of 1/72nd scale Mi-24s offers the best kit in this scale. There are quite a lot of details provided which is a great base even for hyper detailing. I wasn't intending to go that far and just picked a few low spots on the kit where to put some extra detail. After I decided that what was done in the interior was enough i started the painting process. I started wit overall "Light Ghost Gray" from Lifecolor. All raised detail were highlighted with mixture of gray and white. I also did some scuffs and chips with other types of gray. Finally to obtain dusty appearance i gave the lower surfaces a rub with powdered dry pastel in earth color with stiff brush. In the cargo area for the ceiling padding and seat fabric painting I used various shades of Vallejo 70847 "Dark sand". For the cockpit I made my own mixture for "Emerald green". I decided that I will build this with all openable hatches and doors on the left opened, and everything on the right side closed. In the engine bay all on the right is detail painted. When assembling the fuselage halves one have to be very careful. Quite a lot is going on inside and it may cause trouble. My advice is to dry fit and adjust until fuselage halves close without resistance. Generally the fit is excellent with a lot of alignment and fixing aid provided from the manufacturer. After assembly the model was degreased and ready for primer. For priming I used AK Interactive 177 - White primer. For this product make sure you cleaned your model good, otherwise some beading may occur. Primer went on fine and with smooth finish. Riveting followed after the primer was given time to fully cure. All went OK except some areas where I needed to sand. I tried to wetsand but that literally washed the primer away. So have this in mind. Some handles from copper wire were added and I also upgraded the rocket launcher. Here the camo scheme is mapped. I was going for "Afgan" bird. For the "belly" I mixed some blueish gray and sprayed it on. Then it was post faded with lighter shade. To protect it from further over spray I wrapped it in Tristar masking tape. First layer of camo was with Vallejo 70847 "Dark sand". Then it was faded with lighter shade of the base color. From the instructions I scaled and printed the camo pattern. Then I cut the masks and attached them to the model with UHU Tack. The second camo color was Vallejo 71038 "Camouflage Medium Brown". It was also faded with lighter shade. I was not happy with the result after taking the masks down so i went for freehand feathering of the edges. Later chipping was added with gray color. All was followed with Mr. Color GX100 "Super clear III" cut with Mr. Hobby Self leveling thinner. Kit decals are straight awful. Not only they had severe yellowing but were behaving very badly under softening and setting solutions. That's why I used only left and right insignia. I weathered them using the base colors and sponge. With AK Interaktive 2032 "Shaft grease" I did panel line wash.
For the underside I added some streaking. The rotor hub was enhanced with some wires and the blades were painted with AK 135 "Olive drab light base" and faded with AK 136 "Olive drab highlights. Everything was sealed with MIG/AMMO "Satin clear" than I added exhaust staining with mix of the satin clear and black paint. And finally it is completed. This Mil MI-24A build was featured in issue 65 of MENG AIR Modeller magazine. Superb! I've never seen a gorgeous Mi-24"A" like this before. Detailed step-by-step photos are very useful as well. Really wonderful. I shared it to FB to IPMS Bordeaux. That was a very nice build..! !